The Wayside Winds will perform at the St.Mary’s Episcopal Church on Sunday, April 28. Music At St. Mary’s will welcome The Wayside Winds in concert on April 28 at 3 p.m.
Wayside Winds are a group of friends who have to come together to have fun making music. 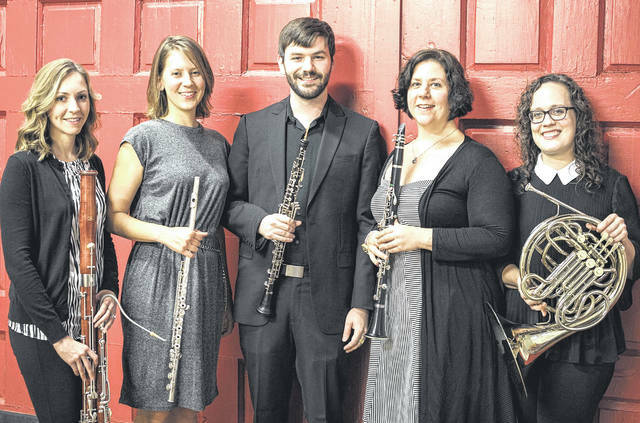 They are all professional musicians based in Cincinnati and are dedicated to performing the canon of woodwind quintet music, but also spicing up each performance with something new and different. The group takes its name form the poem “Catawba Wine” by Henry Wadsworth Longfellow, from which the Queen City derives its nickname. Some highlights from their past seasons include recitals at the Mercantile Library on the Salon 21 concert series, Classical Revolution Cincinnati, the faculty recital series at Mount Saint Joseph University, the Christ Church Cathedral lunch recital series, the Boone County Public Library music series, the Price Hill Creative Community Festival, and Chamberpalooza at the Cincinnati Art Museum. Wayside Winds members are Annie Darlin Gordon (flute), Austin Smith (oboe), Laura Sabo (clarinet), Danielle Batchelder (bassoon), and Emily Toth (French horn). Batchelder, from Sandusky, earned her MM in Bassoon Performance from Indiana University in 2012 under William Ludwig and a BM in 2010 from Capital University in Columbus under Cynthia Cioffari. In 2012, Batchelder was selected as a semifinalist in the Meg Quigley Vivaldi Competition for young women bassoonists, and in 2013, she won her current position of second bassoon with the West Virginia Symphony Orchestra. She has attended summer festivals such as the Spoleto Festival USA, the National Repertory Orchestra, at which she was a featured soloist on Mozart’s Sinfonia Concertante, National Orchestral Institute, Sarasota Music Festival, and Texas Music Festival. Additionally, she has performed with the Richmond, Ind. Symphony, the Richmond, Va. Symphony, the Canton Symphony Orchestra and Lexington Philharmonic. Originally from sunny South Florida, Gordon currently lives in Cincinnati, where she teaches flute and clarinet at MYCincinnati (Music for Youth in Cincinnati), a free El Sistema-inspired after-school youth orchestra program in Price Hill. As an educator, she is passionate about the cross-section between music education and social justice and all that music has to offer to the young mind. Annie earned her bachelor’s and master’s degrees in Flute Performance from the Oberlin Conservatory and Carnegie Mellon University, respectively. She plays flute and piccolo in the orchestra of Queen City Opera, a Price Hill based opera company founded in 2012. Sabo is a freelance clarinet performer and teacher originally from Cleveland. She is a member of the educational outreach ensemble School House Symphony and performs regularly with Blue Ash Montgomery Symphony Orchestra, Hamilton Fairfield Symphony Orchestra, and the West Virginia Symphony Orchestra. She attended Ohio State University for her Bachelor of Music, the Cleveland Institute of Music for her master’s in music, and the College Conservatory of Music at UC for her doctorate. She also performs in local bands the Marmalade Brigade, Lagniappe, and Strange Creature, helps organize and direct Classical Revolution Cincinnati, and teaches at the Cincinnati Music Academy. Smith is currently principal oboe of Queen City Opera and second oboist with the Muncie Symphony Orchestra, positions he has held since 2013 and 2014, respectively. He plays regularly with groups such as the Louisville Orchestra, Lexington Philharmonic, Kentucky Symphony Orchestra, Owensboro Symphony Orchestra, and the Butler Philharmonic. He was a national finalist in the 2014 MTNA chamber music competition with his wind quintet. Since 2009, Smith has been making oboe reeds professionally for iNNOLEDY, a woodwind supply company based in Manhattan. He holds a Bachelor of Music degree from the Hartt School of Music, where he studied with Bert Lucarelli, and a Masters of Music degree and Artist Diploma from the Cincinnati College-Conservatory of Music where he studied with Dr. Mark Ostoich. Toth is an Indiana native, freelancing and teaching in the greater Cincinnati area. She maintains an active private studio in the Milford, West Clermont, Oak Hills and Madeira school districts. She is currently a member of the Queen City Opera and is also a member of the Ohio River Brass Quintet — a chamber ensemble which performs regularly in the greater tristate area with the purpose of performing contemporary and unfamiliar works for brass quintet. Music At St. Mary’s Concerts are provided as a musical gift to this area and no admission is charged. However, donations are accepted following the concert to help defray the concert costs. Also, following the concert there will be a reception to meet and greet the artists as well as visit with other music lovers. St. Mary’s Episcopal Church is located at 234 N. High St. in Hillsboro. Further information can be found at www.masmhillsboro@weebly.com, including a sneak peek at the headliners for the 2019-20 season. Submitted by John Glaze, St. Mary’s Episcopal Church.